New Orleans One thing led to another and I ended up visiting on the phone recently with Victor Menotti, the executive director of the International Forum on Globalization, based in San Francisco, about how to get more traction for a significant piece of research, investigation, and reporting they have done on our friends, the Koch Brothers. They did a report in the fall of 2013 called “Billionaires’ Carbon Bomb: The Koch Brothers and the Keystone XL Pipeline” and created a website called www.kochcash.org and people need to take a closer look. You might ask whether or not any of this is news. After all the Koch Brothers seem to be everywhere these days by spending millions to finance every sort of conservative and Republican effort to take control of the Senate by targeting elections in Arkansas, Louisiana, and elsewhere. Their millions seep down to many of the efforts for Republicans to control state legislatures and create these rightwing Taliban caves across the country with one set of anti-voter, anti-poor, anti-immigrant, anti-women moss-backed policies after another. I had gotten so used to seeing their hands and money behind so many of these efforts that I had lazily just started assuming they were standard issue ideological zealots with more money than God. Much of that is still true, especially the fact that they have more money than God, Gates, Buffet and the rest combined. The IFG report makes it clear that the brothers’ $100 billion pretty much trumps the rest, adding to the danger. The real news in the report, and what makes it still worth reading, is the way they were able to dig out the truth behind the Koch denials that they had anything to gain from their advocacy in favor of the controversial construction of the Keystone XL pipeline to bring dirty oil from the tar sands of Canada all the way through the United States to refineries and shipping in the Gulf. States from Arkansas to Michigan are still involved in cleaning up some of those train wrecks already! Turns out the Koch’s own 2 million acres already in Alberta, Canada, and by the calculations IFG was able to make, they stand to make a pretty penny if the pipeline increases the value of their holdings, at least if you think $100 billion dollars is big money, because that’s the number they could rake in. So no wonder that spending $53 million in contributions to front groups, fake think thanks, and others to advocate for the construction of the pipeline for them is less a political contribution than just another smart, personal financial investment. · The Kochs could earn 1 million times more than the average worker of the pipeline. · Evidence suggests The Kochs alone be responsible for over 19 billion metric tons of carbon emissions in their tar sands holdings. 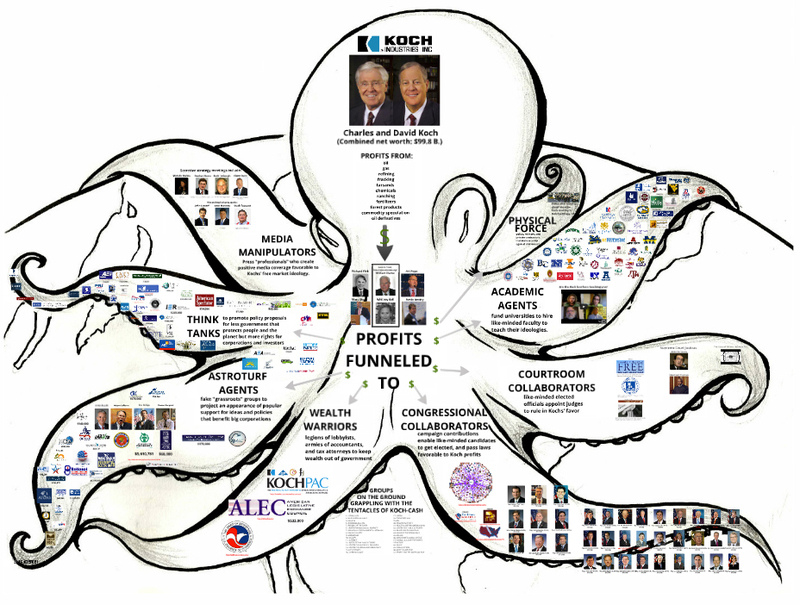 · Think tanks funded by the Kochs have released nearly 1000 pro-KXL reports or statements. Menotti might just have a point. 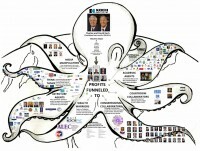 The more everyone realizes why the Kochs have suddenly become the go-to cash cows for the conservatives has less to do with Fox News kneejerk ideology, and cold hard calculation about what puts the most money in their pockets, the rest of us, and, heck, the planet we live on are just collateral damage for big billionaires on the prowl for more money now. Makes you wonder why the Obama Administration still has the pipeline under consideration at all? This entry was posted in Citizen Wealth, Financial Justice, National Politics and tagged Koch brothers, kochcash.org; Keystone XL pipeline, Victor Menotti by Wade. Bookmark the permalink.